ROMERO CANONIZATION: WHEN AND WHERE? Abp. Leon Kalenga incenses relics of Blessed Oscar Romero. The departing Nuncio to El Salvador Archbishop Leon Kalenga Badikebele (reassigned as Apostolic Nuncio in Argentina) reiterated his commitment to obtaining the recognition of Oscar Romero as a “Doctor of the Church” in his farewell address to the Salvadoran Church hierarchy, including all the bishops, plus clergy and religious of the country. [VIDEO.] 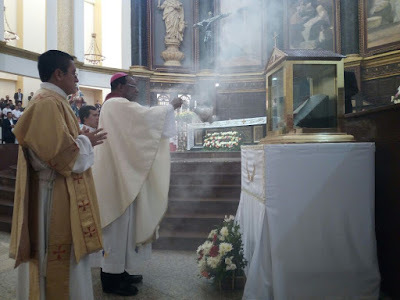 Relatedly, in his remarks on Saturday, April 28, Archbishop Kalenga hinted that Romero’s canonization would be in Rome in October, emphasizing the possibility that Pope Francis could go to “the Saint’s tomb” in a lightning visit to San Salvador on his way to Panama for the World Youth Day in January 2019. Archbishop Kalenga said that the quadripartite “stealth mission” he would leave his successor includes: (1) the canonization cause for Archbishop Romero; (2) the canonization cause for Father Rutilio Grande; (3) the cause for Archbishop Romero as a “Doctor of the Church”; and (4) a cause for the collective recognition of the “holy martyrs of El Salvador”. According to the Congolese prelate, who is concluding his five-year term as the pope’s representative in El Salvador, he expects his successor to be appointed swiftly because he will be required to lead the preparations for Romero’s canonization; its final details will be set in a consistory between the pope and the Cardinals scheduled for Saturday, May 19. During the farewell Mass, Kalenga was recognized as someone who has “worked tirelessly” for Romero's canonization cause, including through his efforts to unify all groups inspired by Romero in order to avoid a “war” between the various interests. Kalenga and his “Friends of Romero.” Photo courtesy: Cultura Romeriana. The dialogue on Romero as a Doctor was launched by Fr. Robert Pelton at a conference at Notre Dame University in the United States in March 2017. Two months later, in May 2017, Archbishop Kalenga took up the project and made it his own. 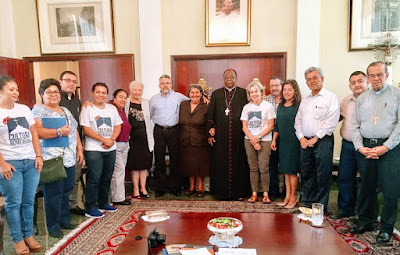 During his homily for the opening of the 36th Assembly of the Latin American Episcopal Council (CELAM) held in El Salvador, Kalenga, a canon law doctor, said he would promote the recognition of Romero as doctor of the Universal Church, “spontaneously and effusively drawing a great and enormous applause” from the assembly, in which delegates from 22 countries in Latin America and the Caribbean participated, including the United States and Canada, according to a CELAM report. Therefore, the first hurdle to overcome, according to Fr. Payne, would be to establish that, as a martyr, Romero is not disqualified from consideration. Father Payne highlighted the evolution of the concept of doctors of the Church, beginning with the first selections, who were “Fathers of the Church”—founders of important communities or branches of Christianity. Later that mold was broken when St. Thomas Aquinas and St. Bonaventure were recognized without having lived in the patristic era, and more recently with the recognition of women and saints who had no formal theological training, such as St. Therese of Lisieux, explained Fr. Payne. Judging by this evolution of the concept, what matters is the importance of a person’s teachings, and not any other characteristic of their holiness, “so even a martyr in whom the Church recognizes eminent teaching can be elevated to the doctorate, notwithstanding the historical practice otherwise,” concluded an analysis published in the influential Jesuit magazine Civiltà Cattolica by Fr. Giandomenico Mucci in 1997. From this perspective, the challenge would be to establish that Romero meets the requirements of eminens doctrina (eminent doctrine), according to norms established by the Vatican in the 1980s, including in the apostolic constitution «Pastor Bonus» of St. John Paul II (1988). In order to be named a doctor, candidates should offer something original that sheds new light on divine revelation, their writings should “have exercised considerable influence on the thought of the church” over a considerable period of time, their teaching should have both contemporary pastoral relevance and perennial value, and they should be more than just “a tireless catechist or preacher, a great ascetic and servant of the poor, or the primary promoter of an important religious movement or devotion,” Fr. Payne related. While it seems that the time may be too little to establish that Romero has had significant influence “for a considerable period”, his promoters are betting that Romero’s extensive legacy and influence will eventually be sufficient to fulfill the requirements and, perhaps, Pope Francis could even declare that Romero is a pastoral example for the Church when he canonizes him. It might also be said that they will seek to promote him for Doctor of the Church, regardless of whether the process is instantaneous, or extends to decades or even centuries.